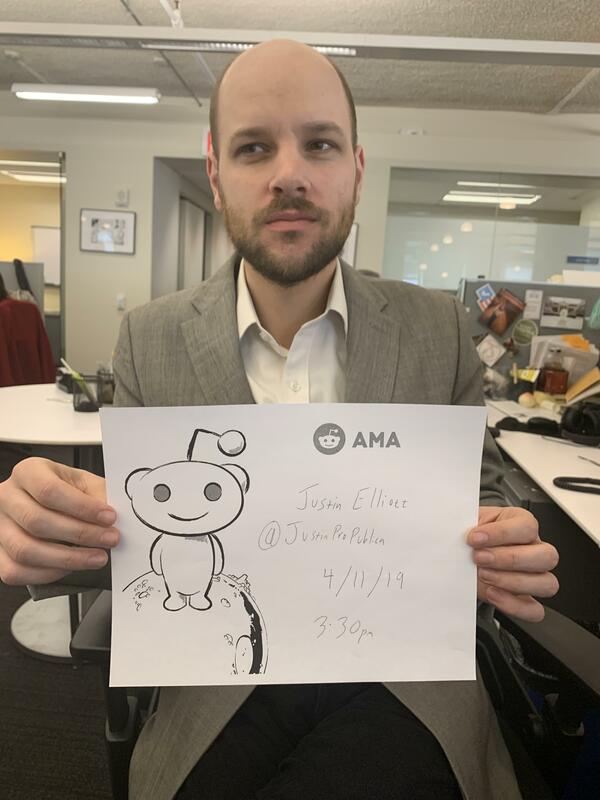 Justin Elliott has been a reporter with ProPublica since 2012, where he has covered money in politics, the American Red Cross, and the Trump administration. He has produced stories for The New York Times, National Public Radio, and others. This week, he’s been covering the so-called “Taxpayer First Act,” which companies like TurboTax (Intuit) and H&R Block have lobbied for because it restricts the IRS from making free, online tax filing a reality for every American. Maybe you’ve seen his piece, or the freshman lawmakers’ responses or some other scrutiny. Maybe you’ve read ProPublica’s story about how the rich underpay $50 billion in taxes every year. Regardless, if you’re in the USA you probably have to file taxes. Ask him anything. ProPublica is a nonprofit newsroom based in New York. Sign up for our newsletter to get our latest investigations. As someone who lives in one of those other developed countries with free online self-filing, it has never taken me more than an hour to file my annual tax forms and it’s very much an easy and casual thing for most people. Given how easy it is for most people from other developed countries, how is the amount of time the US collectively wastes justified to the general population? The way that I've heard it explained is, the unspoken motivation, particularly from the conservative/Republican point of view, is that making people manually do their taxes, makes them more aware of what they are paying to the government and thus more amenable to "small government" type of philosophy. And it would make it more apparent to the taxpayer when the government raises taxes. Whether you agree with it or not, it's probably true that, if we did have the free online self-filing with all the numbers already filled in and all we had to do was approve, the vast majority of people would click through click through the default agree agree agree and have zero awareness of what is going on. Frankly, that's mostly the situation right now since folks just dump their paperwork to an tax preparer and sign whatever comes back. So same end result of ignorance, but they get to pay for the privilege. This fight has been going on for years. The granddaddy of anti-tax advocacy, Grover Norquist, testified against return-free filing way back in 2005. His argument was that getting an official-looking "bill" from the IRS could be "extremely intimidating, particularly for seniors, low-income and non-English speaking citizens." His group later warned the IRS wants to "socialize all tax preparation in America." Hey -- thanks for sharing. We got some really interesting responses from folks in other countries about the ease with which they file their taxes straight through the government tax authority. Maybe! If you believe journalism creates hope, I'm continuing to report on this issue. One thing that would be particularly helpful is hearing from folks that have worked for the industry -- companies like Intuit/Turbo Tax, H&R Block, TaxAct, etc. I'm interested in hearing their views and how the companies treat the "Free File" issues. My email is [email protected] and I can be reached via the Signal app at 774-826-6240. I won't use folks' names without permission. What is a story that you feel has been underreported, or deserves more attention than it has received? Can you reference the provision within the bill (H.R. 1957) that states or implies that the IRS isn't able to create their own filing system? I ask because I called my local House Representative's D.C. office, and the staff person insisted that there was a misunderstanding about the bill and that it does NOT prohibit the IRS from creating their own system. The bill seems very lengthy, and unfortunately without knowing the text in reference, I can't independently determine who is correct. Hi -- I'm not an accountant, but .... you should be able to. Be careful because the eligibility requirements can get tricky. There is also a long history of the companies trying to up-sell those using the Free File product. I don't qualify based on my income...but what is "free" exactly? The cost for someone to prepare the taxes or to officially file them? With the legislation, are there penalties to tax preparers such as Turbo Tax if they were to choose to stop offering the free services? No penalties -- in short, the legislation would put into law a deal between the IRS and the tax software industry. And the deal says: the IRS will not create its own product, while the companies will offer a free version to folks making below an income threshold. One of the big criticisms has been that extremely few of those eligible (2-3%) for the free product actually use it, partly because it's quite difficult to find. Where are you getting this 2-3% number? Anecdotally I know a lot of people who are able to file for free on Turbo Tax or Credit Karma. Are they all just coincidentally in that 2-3%? That figure refers to those using Free File, not other products such as TurboTax "Free" (which, btw, actually puts you on a potentially paying track).